In June 2002 the Maine Historical Society celebrated the centennial of the Wadsworth-Longfellow House as Maine's first house museum. The House is open to the public from May 1 to October 31. For hours and fees, click here. Group and school tours are available by reservation only. For more information, visit our education section. Click here for directions and parking. Within its walls lived four generations of one remarkable family that made significant contributions to the political, literary, and cultural life of New England and the United States. Henry Wadsworth Longfellow (1807-1882), grew up in the house and went on to become one of the most famous men of his time. General Peleg Wadsworth, built the house in 1785-1786, and the last person to live there was Anne Longfellow Pierce, Henry's younger sister. Mrs. Pierce, widowed at an early age, lived in the house until her death in 1901. At that time, in accordance with a deed she executed in 1895, the house passed to the Maine Historical Society to be preserved as a memorial to her famous brother and their family. Virtually all of the household items and artifacts are original to the Wadsworth and Longfellow families. Furnishings from the four generations illustrate changes in style, technology, and attitude over the 18th and 19th centuries. The Wadsworth-Longfellow House is also an important architectural artifact of New England's past. Originally a two-story structure with a pitched roof, it was the first wholly brick dwelling in Portland. Peleg and Elizabeth Wadsworth raised ten children in the house before retiring to the family farm in Hiram, Maine, in 1807. Zilpah and Stephen Longfellow (Henry's parents) added a third story in 1815. The only single-family residence to survive downtown Congress Street's change from a mixed commercial and residential neighborhood on the edge of town to an urban business district, it is the oldest standing structure on the Portland peninsula. 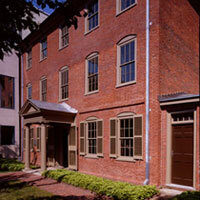 Today, the Wadsworth-Longfellow House is a three-story, brick structure set in the heart of Portland's downtown. Click on the exterior page to learn more about the history and architecture of the building and its setting, then visit the pages for each room to take a peek inside. The restoration page provides a description of the 2000-2002 restoration of the house.